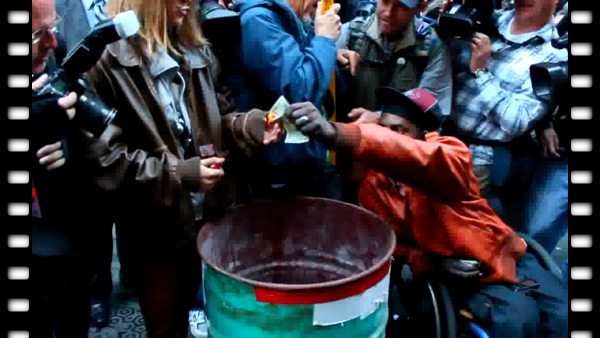 In conjunction with Occupy Wall Street Occupy San Francisco Celebrates their One Year Anniversary. 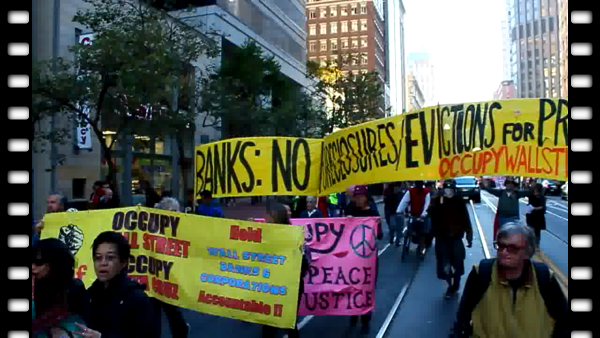 September 17, 2012, Occupiers, protesters, supporters, and victims of the debt and foreclosure crisis took the streets in San Francisco’s Financial District to mark the one year anniversary of the Occupy movement. Many events took place in San Francisco, and all of the events took credit for shutting down many banks in different neighborhoods. And at 5pm there was a mass convergence at 555 California street, which is where many investor groups including Goldman Sachs, and Morgan Stanley are located. At that convergence awards were given to foreclosure fighters, including a 92 year old WW2 veteran, who was or is close to losing his house. After the convergence the protesters and victims of the foreclosure and debt crisis marched through the Financial District thus closing many intersections and streets during rush hour. 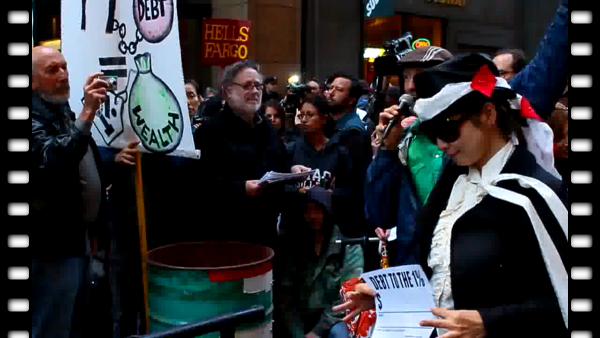 After the march they stopped in front of the Wells Fargo HQ and held a debt burning demonstration and painted on the streets. This anniversary effectively shutdown many streets in the Financial District and snarled traffic and public transportation all day long. The pics and videos are from the days events.